Recently Jordans sent me some of their Crunchy Oat Granola with Raisins and Almonds so that I could try out one of Edd Kimber's new recipes which he has created to celebrate the Jordans garden at the RHS Hampron Court Palace Flower Show. I went for the Cherry Plum Crumble with Cobnuts recipe. Well I say i went for that one but I forgot to purchase the cobnuts or hazelnuts so it was more of a plum crumble. You can see Edd's recipe here, but here is a quick run through of how I made mine. I started by chopping the plums and coating them in the flour and caster sugar. I then rubbed the butter, flour and sugar together before adding the granola. I then placed this on top of the plum mixture. This then went in the oven at 160 degrees for 35-40 minutes. It was a hit with all the family. I even liked it and I am not keen on raisins! I am sure that if I had followed the recipe properly it would have tasted even better but this was pretty good. Jordans have kindly offered 2 of my readers a packet of Jordans Crunchy Oat Granola Raisin and Almond, so they can try some recipes for themselves. Just complete the rafflecopter below. Good Luck! So going to make the crumble. Plum crumble looks a good one to start with! Lemon Muesli Cake sounds amazing! Chocolate cheesecake all the way! Edd Kimber's Honey Nut Bars - yum! Strawberry and Rhubarb crumble and serve it with custard. Would have to be the crumble! I d ask my friend to bake them all ! Then I would try them and pick the best ! I think I'd try this in muffins. I often use oats but I think this just may work too. oooo the honeyed Walnuts and Ice Cream looks great! 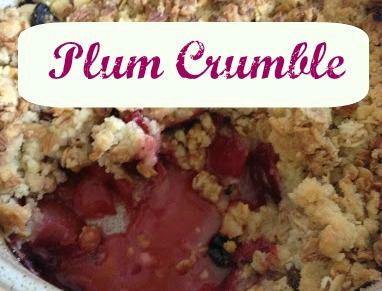 I love crumbles and this looks like a delicious one - adding it to the recipe book now! Billionaires Flapjack - yes please! I would like to try the Lemon Muesli Cake recipe. I would try the Plum Crumble! I love crumbles, and this topping looks great! The chocolate cheesecake looks like a winner! Plum crumble as I have not had any of this since childhood when my mother used to make it. Apple and pear crumble - yum! Edd Kimber's Honey Nut Bars. That Apricot and Apple Granola Crumble Cake looks scrummy! The Apple Crumble looks nice and easy! I'd love to try the choclate cheesecake recipe! It looks delicious! Flapjacks or rhubarb crumble I love them both! I think some Jordans would make a great Flapjack, think I'll have to try that. The Oat Muffins look quite tasty! I would make some flapjacks, and because it's jordans it'll be extra good. That cherry plum crumble looks absolutely amazing!!! the crumble looks right up my street! The plum crumble looks like a good way to use the Jordan's!